Nik Arnoldi is a fifth year art teacher at Escalante-Biggs Academy. It’s an Early Childhood Center in Denver Public Schools (DPS), just under an eleven mile drive from Denver International Airport. It’s a good school; because of Denver’s “school choice” system, there’s a wait list to get in. It’s also in a high-poverty area. Escalante-Biggs Academy is one of over 100 Title I buildings in DPS—a designation for schools that serve high populations of poor students, entitling them to additional federal funding. The statistics are staggering; 84.2% of enrolled students at the Academy are on free and reduced lunch. The school is overwhelmingly Hispanic; according to Nik, almost all staff speak—at minimum—English and Spanish throughout the day. It’s in a food desert, and many students get their first, second, and even third meals at school. Nik chose to work here. He said he had good experiences working in private schools, but wanted to go where he was needed. The reason he’s stayed at Escalante-Biggs his entire career in DPS is simple: as he described it, the school is “like a family.” Staff jokes that if kids get an answer they don’t like from one teacher, they can go to another—like with parents. Everyone supports each other, and the staff value the relationships they can cultivate with kids—the relationships that help them learn and grow. It’s not easy. Over time, Nik has seen a drop-off in parent involvement; although he can’t say for sure, it’s possible the demands of jobs and other responsibilities stretch them thin. The expectations are sometimes burdensome, too; although Nik describes the administration as supportive—even as part of the family—the required paperwork can be a barrier to quality teaching. One colleague described the feeling that they were logging and recording, rather than building relationships with the kids. Nik joined the union, Denver Classroom Teachers’ Association (DCTA), during new educator orientation; he comes from a union family and had been urged by colleagues to seek it out. Lisa Yemma and Aly Nutter, both teachers in DPS, likewise sought out the union; as Lisa put it, she “believed in the solidarity, and working together, and supporting each other.” Now they—and thousands of other Denver teachers—face the city’s first teacher strike since 1994. To better understand the situation they face, it’s important to understand that Denver is one of the fastest growing cities in America. The population of the city itself has skyrocketed since the 2010 census, gaining over 100,000 new residents; as of 2017, the broader metropolitan area grew to 2,888,227 residents, breaking into the top twenty most populated metro areas in the country. With growth often comes inequality, and Denver is no exception. The city is highly segregated; according to the Economic Policy Institute’s “The New Gilded Age” study, the top 1% of residents make almost 20 times that of the 99%—an average $1,348,073 to $68,017. Recent reports rank Denver in the top fifteen cities where the middle class is getting priced out, and some reports rank Denver among the least affordable cities to buy a home, relative to the median income. Even while Colorado’s economy booms, families struggle. Schools follow suit. Although Colorado’s schools ostensibly have “school choice,” the reality is that—as Lisa put it—students often aren’t getting into higher performing schools “unless they have a million dollars to buy a house in the neighborhood.” Colorado’s recent growth has outpaced even the robust U.S. economy, but that money doesn’t necessarily end up in the classroom. The District’s revenues have skyrocketed; meanwhile, instructional spending has declined by 21 million dollars. Administrative bloat and compensation is a factor; according to Aly, documents acquired by the union show that “there are large discrepancies [in] income [between] those at the top and those of us working with students in the classrooms every day.” Just yesterday, a report came out showing millions of dollars in bonuses for administrators. It’s little surprise that Denver teachers find themselves on the precipice of a strike after nearly fourteen months of bargaining. 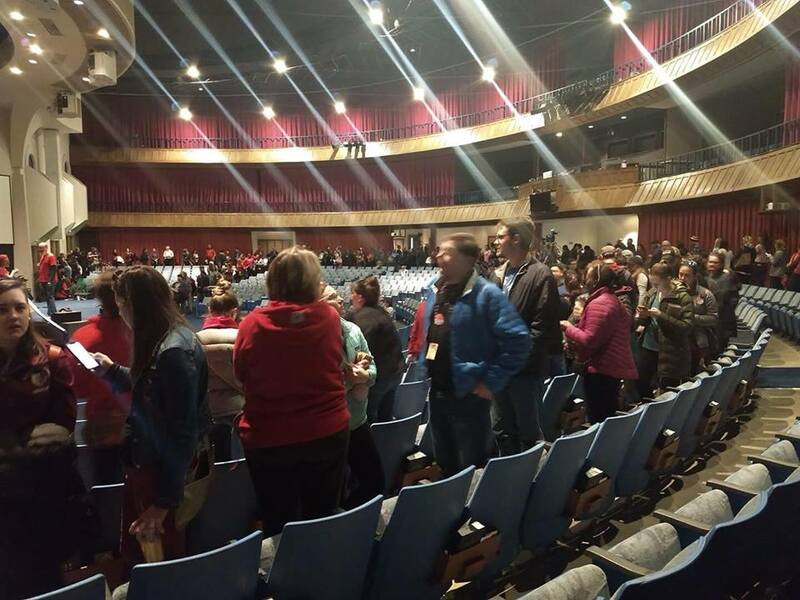 DCTA’s vote, just tallied last night with 93% support, authorizes the union to call a strike as soon as January 28th. It comes at the height of nearly twelve months of rebellion in public education. Just yesterday, United Teachers of Los Angeles (UTLA) just scored a major victory in their first strike in thirty years, one which UTLA President Alex Caputo-Pearl called a “war for the soul of public education.” There are rumblings of more confrontation in Chicago as the Chicago Teachers’ Union begins to prepare for bargaining, recently publicly issuing contract demands over compensation, class sizes, and school resources. Unpredictable wages and a low starting rate has an impact on the students. Lisa described schools where nearly 60% of the staff turns over from year to year; in contrast, schools in more affluent areas of the city—like where she teaches—are much more stable. Nik related a story about a high school student who wanted to apply to college but didn’t have access to a guidance counselor; when the student finally navigated his way through the process himself, he couldn’t find any teachers that had known him longer than a year to write recommendations. The rest had moved on. “We all know,” according to Lisa, “that the relationship that teachers create with kids is the biggest factor in their learning.” With high turnover, the “trust is gone” and teachers can’t create that sort of relationship with their kids. As much as wages, that’s what’s at stake for Denver teachers: providing the stability that kids need to learn and grow. There’s no sign that the District will move; although DCTA reduced their proposal, the two parties are still about $4.5 million dollars apart. Superintendent Susana Cordova has misleadingly called the District’s offer a 10% wage increase; the part she’s left out that the 10% is an average. Some people might get 10%, others might get 2%: a classic divide-and-conquer strategy. That’s because the District offer doubles down on the broken “pro-comp” system while leaving base wages stagnant. The District is already gearing up for a strike, offering double pay for substitutes willing to work as strikebreakers. They’ve even begun to prey on the desperation of furloughed federal workers to recruit more substitutes. If Denver teachers walk out—as it seems they will—they’ll join the now-hundreds of thousands of educators that have taken strike action in the past twelve months. It’s not a decision they take lightly. Nik says that staff are anxious, but understand the importance of standing together to start fixing the problems. C.M. Lewis is field staff for PSEA/NEA and a member of UAW Local 1981. The views above are his own. Want a union? Here are some things to know.